If you own an iOS devices you’d know that iTunes lets you download music to your devices but it doesn’t allow you transfer it from your device back to iTunes or your computer. Something most iOS device owners don’t know is that they can copy their songs from their device back to the computer easily and free. There are a lot of methods of doing this, and it can even be done if your device is not jailbroken. Windows PC users: To get music off your device you don’t even have to jailbreak your device. There are many programs available that will let you do this for free. One of the best program for this is SharePod. With SharePod, you can easily get your songs including playlist made on the device or iTunes, and photos and videos. SharePod also lets you add the music, photos and videos to your devices without the need of iTunes. You can download SharePod for free at SharePod.com/download. 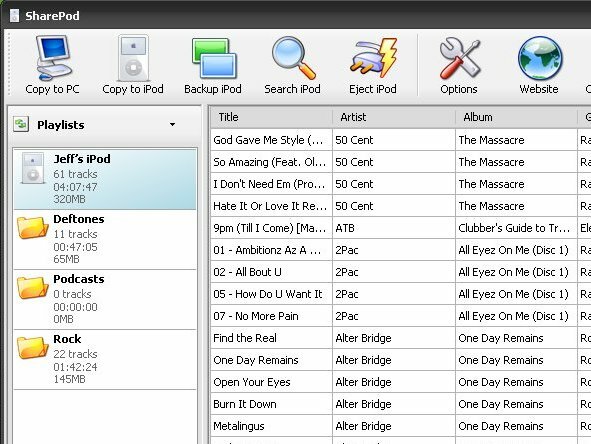 After you download SharePod, you can copy all songs in the device to a place in your computer by selecting Backup iPod, or just Copy to computer. Mac OS X users: To transfer song from your iOS device to a Mac OS X system, you can download Pod to Mac. Pod to Mac is similar to SharePod but allows you to download more things such as SMS, Web history, call history, voice mail and more. SharePod and Pod to Mac are not the only programs to get music off your iPhone, iPad or iPod. You can also use DiskAid or iExplorer to see your see the content in your device.